The Chattanooga shooting inspired an influential former general to call forinternment camps for thought radicals. Pretty outrageous, I know. Imagine how sinister that agenda would be if the Chattanooga shooting is proven to be a scripted hoax? A lone wolf radicalized on the Internet, hopped up on SSRIs but still somehow an expert marksman not seen since Rambo (seriously there are never any survivors). If these people are radicalized, and they don’t support the United States, and they’re disloyal to the United States, as a matter of principle, fine, that’s their right, but it’s our (the government’s) right and our obligation to segregate them from the normal community for the duration of the conflict. This phony shooting story has already resulted in orders to arm the National Guard in various states and more hysterical calls to crack down on online radicalization. Probably much more to come too. 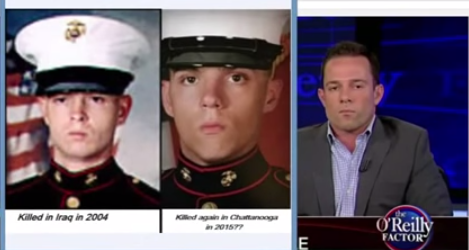 YouTuber MattyD also points to a 2009 Washington Post story featuring an image of the grave site sharing the same name of another alleged Chattanooga victim, Marine Sergeant Thomas J. Sullivan. The story refers to his family starting a D.C. area nonprofit called Sergeant Sullivan Center in his honor. But the ages and images of the 2009 Thomas Sullivan don’t match with the Chattanooga victim, and it’s quite a common name. Nevertheless, it’s becoming obvious to anyone who pays attention to the news that many of these hyped shooting events appear to have the same shady characteristics and the same results — politicians clamoring for more authority to act against thought criminals. More research is needed, but don’t be the last one to realize how badly you’ve been duped. Leave comments below. NEXT STORYGovernment mind control? What is the GWEN Tower really for?